St. Edmund, the first Catholic parish in Oak Park, was founded by Archbishop James Quigley in June of 1907 with the Rev. John J. Code as pastor. For want of a more suitable site, the first Mass was celebrated in the barn of the Scoville Estate (now Scoville Park) on Lake Street and Oak Park Avenue. 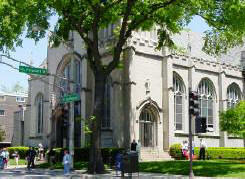 For the next three years Mass was said in a rented hall on Lake Street, east of Oak Park Avenue. St. Edmund Rich Bio: Click here. St. Edmund School, of 15th century French Gothic design, a copy of the Palace of Justice in Rouen, France, was also designed by Henry Schlacks. This was opened in the Fall of 1917 and staffed by the Dominican Sisters from Adrian, Michigan. An annex to the school was completed in 1948. A modern addition to the south of the building was opened in 1959. In 1929 the parish bought the home of W.G. Lloyd at the SW comer of Euclid and Pleasant to be used as a convent. Architecturally significant, the building is thought to be designed by George Maher, the architect who designed "Pleasant Home" in Mills Park. For further details, see below. Murphy Hall, adjoining the north side of the church, was added in 1970. At this time the church was renovated to provide more seating and to conform with Vatican II. St. Edmund Church has been a work in progress. The restoration and renovation of the church in the late 1990's (see below) was begun after some 200 parishioners gathered to formulate a concept statement defining treasures, needs and values of the parish. As a result the windows and ceiling were cleaned and restored. The interior is barrier free and has improved state of the art lighting and sound systems. The ambo and altar, along with the sanctuary, were reconfigured to best express how the liturgy is celebrated today. The original floors were uncovered and cleaned and original pews and wainscoting were refinished. Henry Zimach of HPZS was the architect of this renovation. John Buscemi, the liturgical consultant, redesigned the altar and ambo, and designed a new baptismal font. St. Edmund Parish School began its commitment to excellence in Catholic education in 1917, when Father John Code made plans to construct a school on the corner of Oak Park Avenue and Pleasant Street in Oak Park. Henry J. Schlacks designed the building after the Palace of Justice in Rouen, France. The cornerstone was laid on May 20, 1917, but the building was not ready when school started in September. The children attended Bishop Quarter School on Lake Street until the building was completed. The school was dedicated on October 14, 1917 with a grand procession led by Archbishop Mundelein and Father Code. The Dominican order of nuns from Adrian, Michigan, originally ran the school and lived in a part of the school until a convent was bought for them on the SW comer of Euclid and Pleasant Street. On May 9, 1948, Cardinal Stritch dedicated the annex, which included four new classrooms, a music hall, and a library. Archbishop Albert G. Meyer dedicated the two-story addition to the school on April 28, 1959. In 2005, St. Edmund School formed a partnership with Dominican University in River Forest, continuing its mission of providing a well-founded Catholic education to the next generation of students. St. Edmund Parish School proudly celebrated ninety years of service to the parish and to the community in 2007, the year of the Parish Centennial. After 99 years, the St. Edmund Parish School was closed on June 3, 2016. An account of its final day was published in the Oak Park newspaper, Wednesday Journal. Click here to read the story. For five years in the late 1990's, St. Edmund Parish was engaged in a highly consultative process to restore and renovate the church, school, social hall and rectory buildings in accord with the expressed values and preferences of parish members and the policies and procedures of the Archdiocese of Chicago. The Rededication Mass, celebrating the restoration and renovation work and marking a new chapter in parish history, was celebrated on Sunday, November 19, 2000,. Bishop Thad Jakubowski, Episcopal Vicar of Vicariate IV, presided. The restoration and renovation of St. Edmund Church resulted in civic recognition with the announcement that it was a 2001 winner of the Historic Preservation Award presented by the Oak Park Historic Preservation Commission. The award was presented May 21, 2001 in the Council Chambers of the Oak Park Village Hall by Village President Joanne Trapani. In mid-year, 2004, the parish erected what is thought to be the very first outdoor signage identifying St. Edmund Parish. The sign was donated in loving memory of Helen and Leroy McGuff by Mary Lynn Dietsche; in loving memory of Suzanne C. Guerin by the Suzanne Guerin Memorial Fund; and by its former pastor, the Reverend Joseph B. Ruiz. In November 2004, the sign won the prestigious Oak Park Cavalcade of Pride Award. 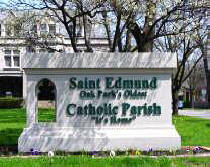 In September, 2010, St. Edmund Parish was again honored by the Oak Park Historic Preservation Commission . The parish received one of the 2010 Oak Park Historic Preservation awards for the redesign of the North Transept area in the church. Fr. John McGivern proudly accepted the award for the parish. Patrick Loughran, parishioner and architect of the new doors, Michael Piazza, Architectural Woodworking, craftsman of the new doors, and Bill Stapleton, parishioner, Oxford Contractors who installed the flooring, were all presented with award certificates.